One of the definite perks of homeschooling is being able to go to tourist attractions during the non-peak time of year. 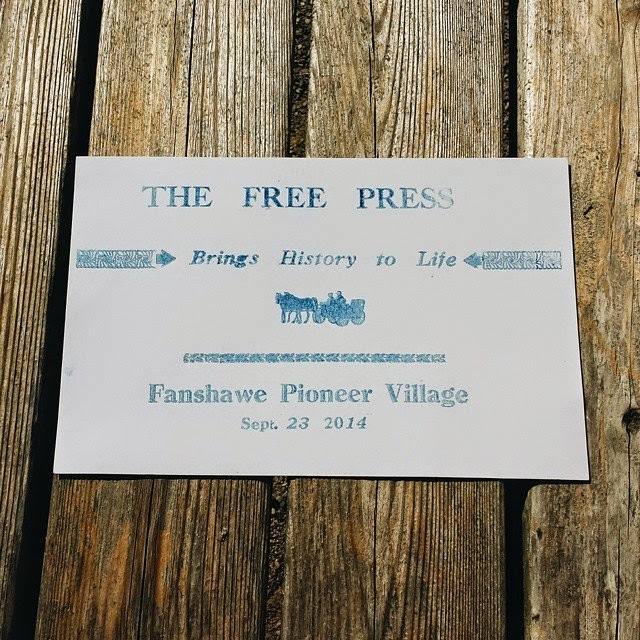 Today we went to visit Pioneer Village with our homeschool friends where we were able to spend some time in the print shop printing our own papers if you will and setting up the presses. I am very fascinated with the houses in Pionerr Village since most of them were built around the same time period that my own house was built. It warms my heart to think about the families that called my own house their home hundreds of years ago. \Take a glimpse into this house set up for the 1820's living on a farm as a true pioneer on our land. The modest furnishing that they had just making do with what they had and have no care in the world as far as electronics goes. How I would love to truly experience are simple time in life where we would cultivate the land to feed our family and live in one room all together and not off in our own little rooms on our laptops. You must admit that really does sound good. I hope you enjoyed your glimpse into Pioneer Times here at Pioneer Village. I know the group I toured the village with just loved exploring while we were there. If you want more of a glimpse into Pioneer Village be sure to check out my daily vlog on YouTube for that day posted below. What are some neat tourist attractions in your area that you like to do?